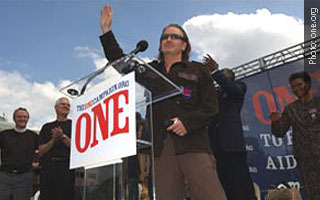 The ONE Campaign grew out of the Heart of America tour in 2002, in which a busload of citizens and celebrities toured the mid-West in support of a new U.S. initiative on global AIDS. The success of that trip insured that a new constituency of Americans were raising their voices for Africa and needed to be heard. Together with the Better Safer World Campaign, representing nine of the largest, most effective private aid agencies (with 3 million supporters) working together to fight global poverty, and Bread for the World, a Christian voice for ending hunger for more than 30 years, the ONE campaign got off to a great start. The campaign launched in front of Independence Hall in Philadelphia on May 16 with the help of supporters like the NBA and U2’s Bono, co-founder of DATA. Since then, over 100,000 people have signed the declaration to support an historic pact for compassion and justice – and help the poorest people in the world overcome AIDS and extreme poverty. The ONE Campaign was founded by Bread for the World, CARE, DATA, International Medical Corps, International Rescue Committee, Mercy Corps, Oxfam America, Plan USA, Save the Children US, World Concern, and World Vision, and works closely with the National Basketball Association, Rock the Vote, and the Millennium Campaign. 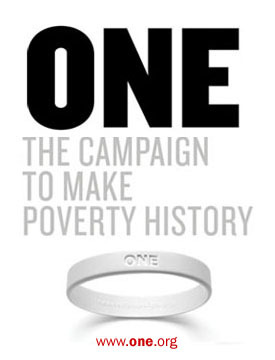 The ONE Campaign is supported by the Bill & Melinda Gates Foundation.